Two weeks have passed since the Plasma 5.8 release and our Wayland efforts have seen quite some improvements. Some changes went into Plasma 5.8 as bug fixes, some changes are only available in master for the next release. With this blog post I want to highlight what we have improved since Plasma 5.8. KWin’s server side decorations have a feature that one can resize the window in the shadow area. With the Breeze window decoration this is available if one uses the border size “No Side Borders” or “No Borders”. For Wayland we just had to adjust the input area of a window slightly and honor it when evaluating the mouse pointer movements. We found a few bugs related to global shortcut triggering. There is some unexpected behavior for shortcut triggering in xkbcommon, which will be addressed in the next release by adding new API. For now we had to workaround it to support some shortcuts which no longer triggered. Of course for every kind of shortcut which did not trigger we added a test case so we can also in future ensure that this works once the new xkbcommon release is available. At the moment we are not aware of any not working global shortcuts on Wayland. If you hit one, please report a bug. KWin did not enable the LEDs for num lock, caps lock, etc. This was mostly because I don’t have any keyboard which has such LEDs – neither my desktop keyboard nor my two notebooks have any LEDs. So I just didn’t notice that this was missing. Once we got the bug report we looked into adding this. I want to take this as an example of the “obvious bug” one doesn’t report because it’s so obvious. But if one doesn’t have such hardware it’s not so obvious any more. A feature we added for Plasma 5.9 is support for the relative pointer protocol. The protocol is implemented in KWayland 5.28 and KWin is adjusted to support the relative pointer events as can be seen in the screenshot of the input debug console. This is a rather important protocol to support games on Wayland. We also plan to add pointer confinement for Plasma 5.9. Our widget styles Breeze and Oxygen have a feature to move the window when clicking in empty areas. This is a feature which needs to interact with the windowing system directly as Qt doesn’t provide an abstraction for it. On X11 it uses the NETRootInfo::moveResizeRequest, on Wayland support for triggering a window move is built into the core protocol. But so far we were not able to provide the feature on Wayland as we just didn’t have enough information from QtWayland. For example we lacked access to the wl_shell_surface on which we have to trigger the move. So some time ago I added support to QtWayland that we can access the wl_shell_surface through the native interface. Now about a year later we can start to use it. To support this feature we need to create an own wl_seat and wl_pointer object and track the serial of pointer button press. This we can then pass to the move request on the ShellSurface. 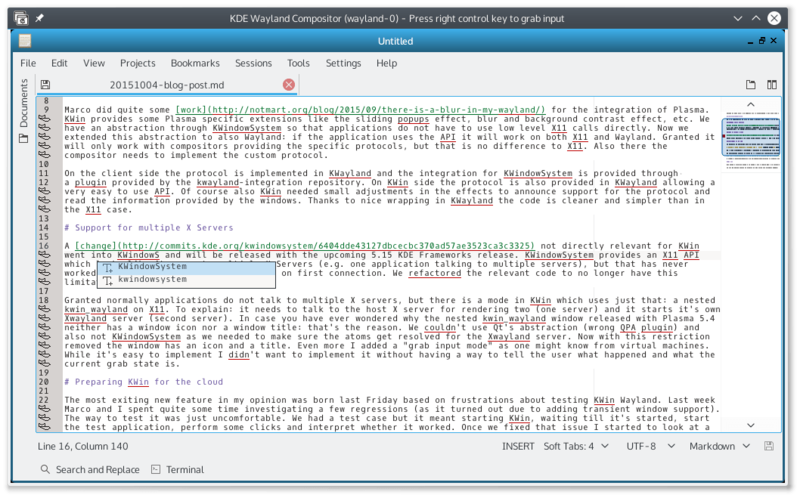 The change is not KWin specific at all and will work on all Wayland compositors. A new feature we added in KWin 5.0 is the possibility to synchronize the color scheme from the window into the window decoration and the context menu on the decoration. On X11 this works through a property which our KStyle library sets. This was the best we had back in the early days of the 5.x series as Qt didn’t expose enough information. It has the disadvantage that the sync only works with QWidget based applications and only with widget styles inheriting KStyle. For Plasma 5.9 we improved that and brought the relevant code into plasma-integration. The restriction to QWidget is gone and it works now with all kind of windows by listening to the QPlatformSurfaceEvent. This very useful event which got added in Qt 5.5. It informs us when a native window is created for a QWindow. Thus we can add our own X11 properties on the native window directly after creation and before the window is mapped. While adjusting this code for X11 we also added the relevant bits for Wayland. We use the Qt Surface Extension protocol to pass a property to the server. That’s a small and neat addition the Qt devs did to allow communication between a Qt based client and a Qt based Wayland compositor. As one can see in the screenshot the color scheme now updates also for Wayland applications. Window icon handling in Wayland is different to X11. On X11 the icons are passed as pixmaps. That has a few disadvantages nowadays because the icons provided on the window might not have a high enough resolution to work well on high-dpi systems. The icon from the icon-theme though provides higher resolution. On Wayland there is no way to pass window icons around and the compositor takes the icon from the desktop file of the application. This works well unless we don’t have a desktop file. For such windows we now started to use a generic Wayland icon as the fallback, just like we use a generic X icon as fallback for X11 windows which don’t have an icon. That’s an icon which one might have noticed when using a Plasma Wayland session as every Xwayland window only had the generic X icon in the task manager. The communication between KWin and the task manager also passes the icon name around and not pixmap data. This works well for everything which isn’t Xwayland where we normally just don’t have the name. For Plasma 5.9 we addressed this problem and extended our protocol to request pixmap data for a window icon which doesn’t have a name. Thus we are now able to also support Xwayland windows, which increases the useability of the system quite a lot. On Wayland several of our effects broke in a multi-screen setup. This is because rendering is different. On X11 all screens are rendered together in one rendering pass and we have one OpenGL window to render to. On Wayland we have one OpenGL window per screen and have one rendering pass per screen. That’s something our effects didn’t handle well and resulted in rendering issues. For Plasma 5.9 these issues are finally resolved. One of the affected effects is Wobbly windows. A rather important effect given that this blog is subtitled “From the land of wobbly windows”. We experienced that in a multi-screen setup the effect was only active on one screen. If the window got moved to the other screen it completely vanished. I was quite certain that this is not a problem with the effect itself, but rather with the way how we render. As we also saw other effects having rendering issues in multi-screen setups I was quite optimistic that fixing wobbly would fix many effects. The investigation showed that the problem in fact was an incorrect area passed to glScissor due to the general changes in rendering explained above. Rendering on other screens got clipped away. With the proper change we got wobbly working and several other effects (Present Windows, Desktop Grid, Alt+Tab for example) without having to touch the effects at all. With that knowledge in place we looked into fixing other effects. E.g. the screenshot effect which allows to save a screenshot in the tmp directory. A few example of screenshots taken with this effect can be seen in this blog post. The problem with this effect was that when taking a fullscreen shot over all screens only one got captured. The assumption here was that our glBlitFramebuffer code needs adjustment to be per output and with that we can now screenshot every screen individually or all screens combined. Related to that are the blur and background contrast effect as they also interact with the frame buffer, though don’t use the glBlitFramebuffer extension. With those effects one of the biggest problems was that the viewport got restored to a wrong value after unbinding the frame buffer object. Due to that the rendering got screwed up and we had severe rendering issues with blur on multi screen. These issues are now fixed as can be seen in the screenshot above: both screens are rendered correctly even with blur enable. 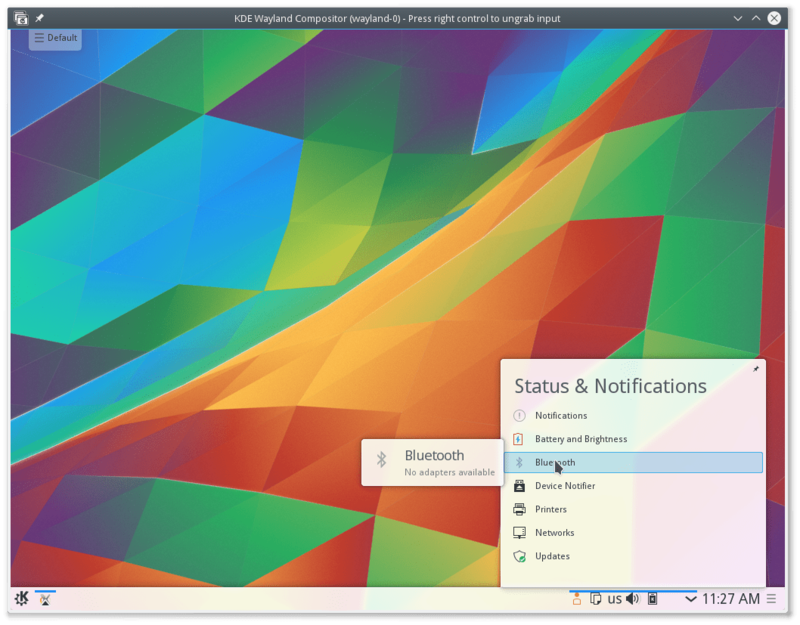 Plasma’s panel got some improvements for Plasma 5.9. This started from bug reports about windows can cover not working and also auto-hide not working. Another example that it is important to report bugs. On X11 auto hiding panels use a custom protocol with KWin to indicate that they want to be restored if the mouse cursor touches the screen edge. It uses low level X11 code thus we also need a low level Wayland protocol for it. We extended our plasma shell protocol to expose auto hiding state and implemented it in both KWin and Plasma. We had a bug report that search in the widget explorer doesn’t work. The investigation showed that the reason for that is that the widget explorer is a panel window and we designed panels on Wayland so that they don’t take any keyboard focus. This is correct for the normal panel, but not for this special panel. We adjusted our protocol to provide an additional hint that the panel takes focus and implemented this in kwayland-integration in a way that the widget explorer gains focus without any adjustments to it. Of course there are more potential users for this new feature. One being KRunner. Once we had the code in place we decided to make KRunner a Panel on Wayland which brings us quite some improvements like it will be above other windows and on all desktops. As a kind of Christmas present to our Wayland users I’m happy to announce that over the last two weeks I worked on adding support for server-side decorations. The main motivations for working on it was the fact that I want to switch to Wayland as primary driver for my system and the nested KWin running on top of another Wayland server, which I need for development, doesn’t have any decorations. Of course I could have implemented client-side decorations for it. But as my readers might know, I consider client-side decorations as an inferior solution. And KWin of course has support for server-side decorations anyway for X11 and thus it’s less work to go for server-side decoration than to go for client-side. The second reason is that Qt’s default client-side decorations are comparable ugly and lack important features like a difference between active and inactive windows which makes using a Wayland session really hard. In this case a possibility could have been to develop a plugin so that KDecoration based themes could be used for client-side decoration. But to get it really useable this would have required a complex protocol to get in on par with what KWin internally has. A core element is a protocol to negotiate whether a window should have server-, client-side or no decoration which got added to KWayland. KWin got an implementation for that both as server and client. I plan to submit the protocol for inclusion in Wayland next year. I do think that this can be a general solution: KWin won’t stay the only Wayland compositor preferring to not have client-side decorations. If we think about tiling and use cases like phones we see that client-side cannot be the ultimate solution. Thus I think it’s a useful extension. Of course it doesn’t forbid client-side decoration, that’s still possible with the protocol. So GTK+ applications build upon client-side decoration are still able to use it, but of course I highly recommend to use server-side decorations on a system that prefers server-side decorations (the protocol is also able to tell that). Happy holidays and a successful Wayland year 2016!